Lately I’ve been playing with Ableton Live and FLStudio on my laptop and wanted to get some better audio performance than the built in sound card had to offer. My laptops onboard sound card just doesn’t do it’s job that well and I figured even a cheap replacement had to be better. 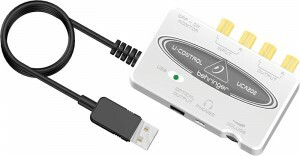 After some research and a few trial and error purchases I found this guy: the Behringer UCA 202. Just an FYI, some people refer to this type of device as a USB DAC, and that’s perfectly acceptable. It is indeed a DAC (which stands for Digital to Analog Converter) and it does a great job at converting your digital music to analog. Also, this device comes in a red version that functions exactly the same way. Pick the color scheme that works best for you. For me there are 3 major reasons to use a USB audio interface instead of my laptop’s onboard sound. When I loaded up Ableton Live with just a few sounds and effects my sound started to crackle and pop and skip. This is most likely because Ableton was using so much CPU to simulate synthesizers that it neglected to update the audio buffers on my stock sound card. As soon as I switched to a USB audio interface the crackles and pops went away. With onboard sound I was getting some serious delay between pressing a key on the keyboard and hearing the sound come out my headphones. The Behringer has way less delay and makes it that much more pleasant to use. If latency matters to you (like if you are producing audio recordings and effects), then you should look in to installing ASIO4All which offers significantly less latency than the standard Windows interface. Sometimes it’s hard to tell if one audio device actually sounds better than another, but in this case boy can I hear a difference between stock sound and a USB audio interface. Especially with headphones on. It’s like night and day. If you are looking for a decent USB DAC or audio interface then it seems like you can’t go wrong with one of these. It’s a bit annoying to have it dangling off the USB port on a laptop so it’s not really good for everyday computing. When you’re working on audio files or at your desktop, though, these things really sound nice and work well. I have the BEHRINGER U-PHORIA UM2 which has all kinds of hiss. Will your recommendation bring that noise down? I too, have a sound card that really can’t handle Ableton. Will this product help with with the sound card load? Also, regarding frostdate.com, you did a great job on that! I refer to it occasionally. What I think will make it even better is adding a search by zone AND month, that way one can narrow it down to exactly one month. Thank you for the free info. I think that if you are having sound problems in Ableton the first and most important thing to do is install ASIO drivers, go into Ableton’s audio settings, and make sure that you are only using the ASIO devices. Inside Ableton bring up the ASIO settings and turn the little power button off for your onboard audio and on for the USB audio. For me this makes a massive difference. Be sure to use the “Test Sound” button, which emits a light tone at 50% cpu load. As far as FrostDate goes, what an excellent suggestion! I’ll figure out how to implement that because I totally agree, that would be fantastic this time of year.